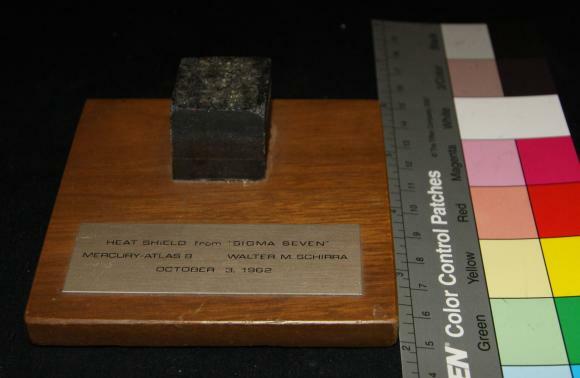 This fragment of the ablative heat shield of Astronaut Walter (Wally) M. Schirra's Mercury Atlas 8 (MA-8) capsule, the fifth U.S. flight of a manned spacecraft, demonstrates the impact of reentry into the atmosphere from orbit. Each Mercury spacecraft featured a gently curved heat shield with a diameter of 203 cm (80 in) and a radius of curvature of 305 cm (120 in). Heat shields protect by creating a shock wave in the thin upper atmosphere that holds the superheated gas away from the spacecraft, creating a somewhat cooler boundary layer. An ablative shield’s material chars, melts, and sublimates, carrying away the remaining heat, protecting the spacecraft. The charring demonstrates the impact of temperatures of nearly 1100 C (2000 F) degrees during a reentry at a velocity of over 27,000 km/h (17,000 mph) from low Earth orbit.